Jamehl Wiley of the University of Maine comes off the field during the Black Bears' Sept. 22 game at Central Michigan. ORONO, Maine — Defensive ends don’t usually show up prominently on stat sheets. But they are crucial to the success of the defense. They are responsible for containing the quarterbacks and running backs, funneling them to the inside where the linebackers and safeties can make the tackles. Defensive ends, who also are keys to the pass rush, often have to fight off double-teams. Jamehl Wiley is making his presence felt as a defensive end for the University of Maine, which has one of the nation’s top defenses. Last Saturday, the redshirt freshman teamed up with linebacker Sterling Sheffield to stop Towson running back Shane Simpson 2 yards short of the goal line on a fourth-and-goal with 1:21 remaining to preserve a 35-28 victory. Wiley wrapped his arms around Simpson’s legs and Sheffield added the finishing touch. “That was the highlight of my year,” Wiley added. “That was huge. … He has made a ton of plays for us,” UMaine head coach Joe Harasymiak said. The play generated excitement among Wiley’s cheering section of 14 family members, who drove the 69 miles from his hometown of New Castle, Delaware, for the game. Wiley is undersized for a defensive lineman but packs 236 pounds on a 6-foot-2 frame. “Technique is everything. Size doesn’t matter that much,” Wiley said. “He has probably the best technique I’ve seen since I’ve been here (eight seasons), and we’ve had some real good ends,” Harasymiak said. Wiley has been involved in 25 tackles, including five for negative yardage, with 1½ sacks. UMaine ranks third in the Football Championship Subdivision in total defense, allowing 261.6 yards per game. The Black Bears are second in sacks (4.1 per game) and have the nation’s second-best run defense (71 ypg). While UMaine usually doesn’t play first-year players because of the jump from high school football to Division I, Wiley’s coaches said Wiley would have played last season if he hadn’t suffered a season-ending knee injury during preseason. Wiley was an outstanding player at St. Frances Academy in Baltimore and was originally going to attend the University of Delaware. “But when I came here up for my visit and got to hang out with the team, it was like a family. They were building something here. This is where I wanted to end my career. I love it up here,” Wiley, who is from an athletic family with several football- and basketball-playing brothers, said. “Basketball was the big thing in my family but I couldn’t be as physical as I wanted to be in basketball. You can take out a lot of anger in football,” Wiley, who added that he loves rushing the passer, said. 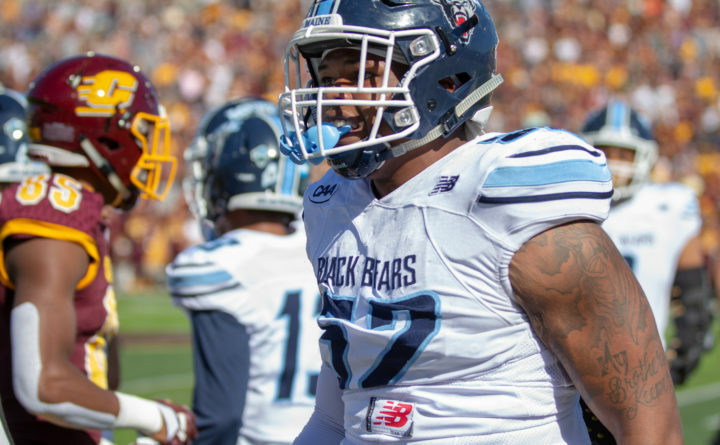 The Black Bears (6-3 overall, 5-1 Colonial Athletic Association), who are tied for first place with Delaware, can take another step toward a conference regular-season title when they visit Richmond (3-6, 1-5 CAA) at 3 p.m. Saturday.